The future of classical music has been a much-discussed and heated topic during recent years in the West. Cuttings on state funding for orchestras, an aging audience, ever declining ticket sales…the challenges faced by art music seems myriad. China on the other hand is embracing classical music with great enthusiasm and zeal, having many of the things that the classical music scene in the West desperately lacks: a young audience, state funding, and a growing market which continues to gain strength. But how did China of all places become to harbor classical music? And what exactly is the present and future of Western art music in China? The Chinese have traditionally been known to be quite open to other cultures when it comes to music. The first recorded interaction between Western music and China dates back to the year 1601, when Italian Jesuit priest Matteo Ricci brought a harpsichord as a present to the Court of the Ming Dynasty and introduced Western music to the locals. It wasn’t until the Qing Dynasty in the 19th century era, however, that the influence of Western music became more prominent. The classical music scene in China took off with the New Culture Movement (also known as the Chinese Renaissance) of the 1910s and 1920s when Western ideas were zealously embraced, cementing China’s interest in Western art music. It also started the touring of Chinese musicians to the West who were now bringing back and disseminating their experiences and knowledge about Western music in their native China. Symphony orchestras were formed across the country, and classical music reached wide audiences through concert hall performances and the radio. Then came a setback for the classical music scene with the aftermaths of World War II which lasted until the late 1970's. In 1973 US President Richard Nixon set out to start cultural exchange between China and the West, which included not only the famous ping-pong match that lent its name to “ping-pong diplomacy,” but also a visit from the Philadelphia Orchestra. 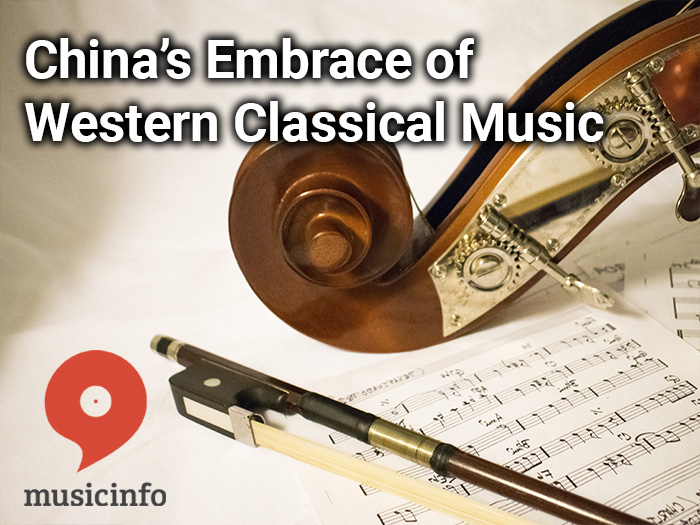 This set the path for China’s embrace of Western classical music as we know it today. Since the closed days between World War II and the end of the 1970’s, China has come a long way from repelling Western classical music to being one of its biggest consumers and contributors in the whole world. For example, today China is the largest consumer and maker of pianos, producing 80% of the world’s supply. Pianists like Lang Lang, Li Yundi, and Yuja Wang have risen to the status of global superstars, inspiring Chinese youngsters to take up the piano to become stars like their heroes. The number of children learning to play the piano in China is currently estimated to be around 40 to 60 million. Children are also brought by their parents to see orchestral performances, where they can then pick up the musical instruments and try them out for themselves. In contrast to the West, Chinese audiences that consume classical music are much younger, which ensures the future of the classical music scene in China which looks very bright. New orchestras and conservatories pop up constantly all over the country complete with a state funding. This fast growth is at least partly fueled by competition: if a town gets an orchestra or for example a violin competition, the next town demands equal rights and the state duly provides it. Classical music stations, online education, and outdoor classical music festivals are also helping to introduce and promote classical music to the general public. Online access to concerts and inexpensive tickets all help audiences to gain access to the world of classical music: given China’s huge population the tickets to local events sell well, showcasing the advantage China’s enormous market has. For example, the 2018 New Year’s concert by the German orchestra Staatskapelle Dresden got 5 million views on Tencent Video (a major video streaming platform in China) in just two days. Currently audiences in China have better access to classical music than ever: world-class orchestras including the Berlin Philharmonic and the Vienna Philharmonic Orchestra travel regularly to the country for performances. The Shanghai Concert Hall alone has scheduled 320 classical music concerts for 2018. China is not only importing classical music but exporting it too: take for example the Shanghai Chinese Orchestra which has been touring Europe. The orchestra is adding ancient Chinese instruments like the plucked string instrument zhongruan and the bowed instrument erhu to break the boundaries between Chinese and Western classical music. While Western classical music is developing in China at phenomenal speed, reciprocally contemporary Chinese composers bring fresh aspects to classical music for Western listeners to enjoy. The new rising generation suggests that the future of classical music might indeed be China. Another case in point is the situation with students in Western music institutions. As the demand for higher music education falls in the West because students seek more lucrative occupations; this creates a necessity in Western music institutions to seek Chinese students to keep their businesses going. Germany for example offers free tuition for Chinese students to maintain its Academies for Music, as filling them with domestic students in the current situation is a tall order. This trend might well result in a mutually beneficial cultural exchange between the East and the West. The booming Chinese classical music scene already has some famous proponents in the West. The chairman of the Vienna Philharmonic, Daniel Froschauer, says there will be “an extremely excellent orchestral landscape in China” due to the ever increasing number of highly-talented musicians coupled with a strong public interest. Froschauer was also taken with the fact that the Chinese audience expresses a keen interest in cultural aspects of classical music and that they understand the music well. Superstar tenor Placido Domingo was impressed with the enthusiasm of Chinese audiences when performing in China and, like many others, predicted a boom in China’s classical music market. How would you like to be a part of the future of classical music? Join the growing number of classical artists who take their music to the fast-growing Chinese classical music scene with Musicinfo and check out a classical music playlist from China on QQ Music! Incidentally, the playlist has been listened to over 3 million times already - classical music is indeed booming in China.